Office space is expensive, no matter where you live. You can’t afford to pay for square footage that you aren’t actively using. Yet you also have occasions where you need more space than you use every day — such as when you are hosting business clients or when you need to have a department meeting or company-wide meeting. The Juggernat — massive extendable table looks like any other table when it is in its base form. It has a modern aesthetic with clean, straight lines with no engraving or other embellishments. The table seats six people — two on both sides and one on each end. 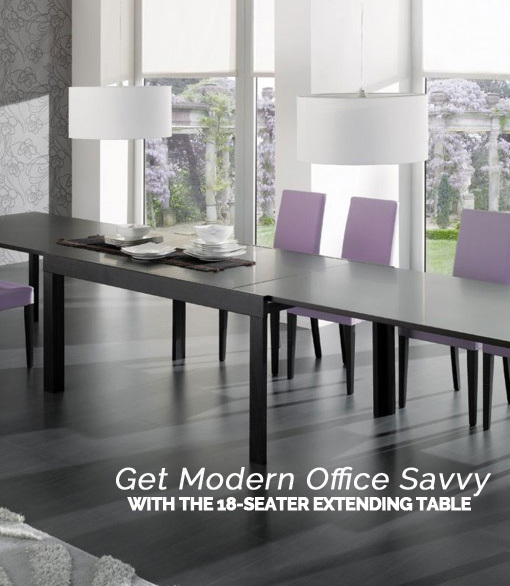 However, when you extend the table, it can seat up to 18 people. 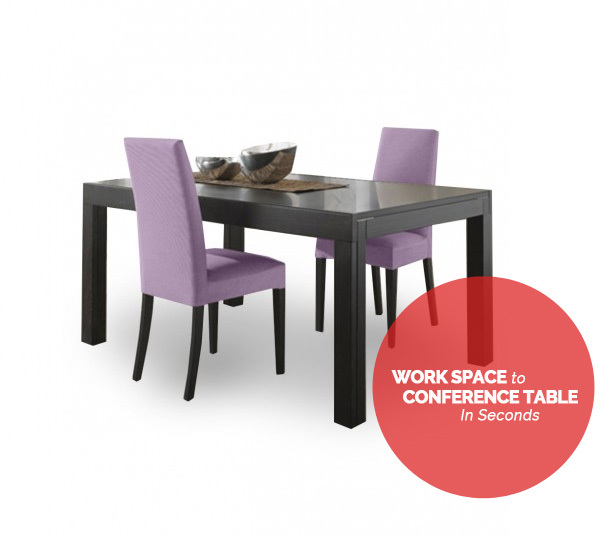 Unlike other extending tables, you don’t have to drag out the leaves from another storage area. The leaves are stored right in the table top. You just pull the legs out to the side, and the table top goes with them. The leaves are in the middle, and you pull them out to put on the top. With this design, you don’t have to get special equipment from any other location, and you don’t have to lift anything or move any levers or hinges. The side pieces slide straight out horizontally, and the legs are already in place. The legs for the extended pieces fit into a notch on the legs for the main table piece. You can choose options to get the table to look however you want. Natural wood finishes include beech, cherry beech and wenge beech. All of these create a traditional and beautiful look for the table that will improve the decor of the room and impress guests and clients. You can pair chairs in a variety of styles so you can create a unique look. Because the table has such a clean design, you can choose chairs that are ornate or equally streamlined and they will all look good together. You can also choose chair fabrics in a variety of colors and prints. The Juggernaut — massive extendable table is very versatile, and you can use it in a lot of ways in your office. The most beneficial way to use the table is as a work space and conference table. Put the table in a room where you regularly work, such as a research room or library. The table can be in the middle to provide a space to read, write or study, and the walls can be lined with bookcases and other shelves. When you need to host a board meeting, you can extend the table without having to move any other furniture. You’ll just need to bring in extra chairs. Folding chairs are the perfect solution, and these can be stored in a cabinet right in the room. Or you can get an expanding chair that goes from space for one to a bench that can seat 12. It pairs perfectly with the extending table. 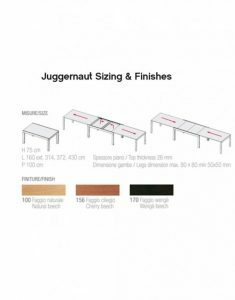 You can also use the Juggernaut — massive extendable table for office parties and celebrations. It can sit in your employee lounge or lunch room when in its base form, and you can pull it out to accommodate larger gatherings when you are celebrating an employee birthday, baby shower or anniversary. The Juggernaut has many great uses, and it has gorgeous yet professional style that will elevate your office space. 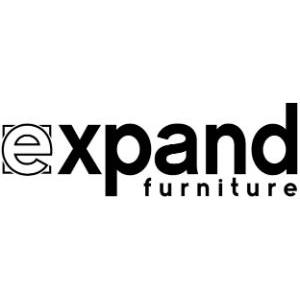 You can buy the Juggernaut — massive extendable table from Expand Furniture. We also sell folding chairs and expanding chairs that you can pair with the table. 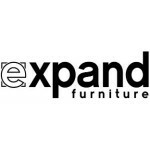 We carry a large selection of space-saving furniture for your home or office, including transforming tables, modular shelving units, wall beds and more. Explore our catalog to find the perfect furniture for your space. All our furniture is made of the highest-quality materials and includes options for customization.